Bookeen teases the Odyssey, a new eReader with High Speed Ink System (HSIS) technology. The company says its based on E Ink's technology and boasts it's able to deliver the responsiveness of LCD tablets like the iPad. The device is expected to ship within a couple of weeks. Dubbed the High Speed ​​Ink System (HSIS), the technology will debut with the Cybook Odyssey, due out in Europe in the "coming weeks", Bookeen said. 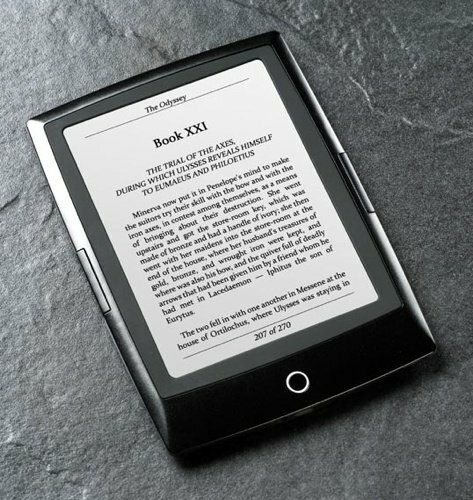 Alas, it hasn't said much about HSIS, other than noting it is indeed based on E Ink's technology but is "faster, more responsive and more fluid" than E Ink's current screen, Pearl, found in Amazon's Kindles and Sony's Readers.